How Does a Hurricane Work? 2 It's been front page news many times. A hurricane makes landfall and causes tremendous damage and loss of life in communities along the coast. But why does it happen this way? How does a hurricane work? 3 A hurricane begins with a cluster of thunderstorms known as a tropical depression. A tropical depression is an area of low pressure with wind speeds of less than thirty-eight miles per hour. 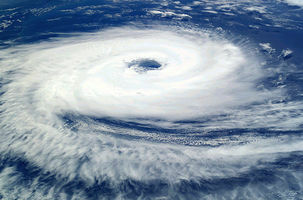 Some tropical depressions grow and increase in wind speed until they become tropical storms. A tropical storm has wind speeds of thirty-nine to seventy-three miles per hour. Some tropical storms continue to grow until they become hurricanes, huge storms with wind speeds of seventy-four miles per hour or more. 4 Hurricanes begin over the ocean in particular areas of the world. It takes a specific set of circumstances to create a hurricane. There must be warm water and warm, moist air that rises. That is why hurricanes usually begin in the tropical latitudes over oceans. Feedback on How Does a Hurricane Work?